The compliance of the chest wall describes the relationship between the transmural pressure across the chest wall compared with the chest cavity's volume. By transmural pressure we mean the relative pressure between the atmospheric pressure compared with that in the intrapleural space. Positive transmural pressures mean greater intrapleural pressures than atmospheric pressures. Conceptually, it may be more helpful to conceive of the isolated chest wall compliance curve as measuring the volume of the chest cavity if the lungs were removed and the internal pressure within the cavity was changed, signifying the intrapleural pressure. Several qualitative features of the lung compliance relationship are important to appreciate. The first is to appreciate that the chest cavity has a large volume when there is no transmural pressure (i.e. the transmural pressure is zero). This is the result of the natural tendency of the chest wall to spring outward, likely due to its skeletal and muscular anatomy. Consequently, in order to reduce the chest cavity volume, progressively large negative intrapleural pressures must be generated. However, the outward springing tendency of the chest wall does have limits and past a certain threshold, greater chest cavity volumes can only be achieved by applying positive intrapleural pressures. Consequently, at extremely large chest cavity volumes, even the chest wall displays a natural tendency to recoil toward smaller volumes. 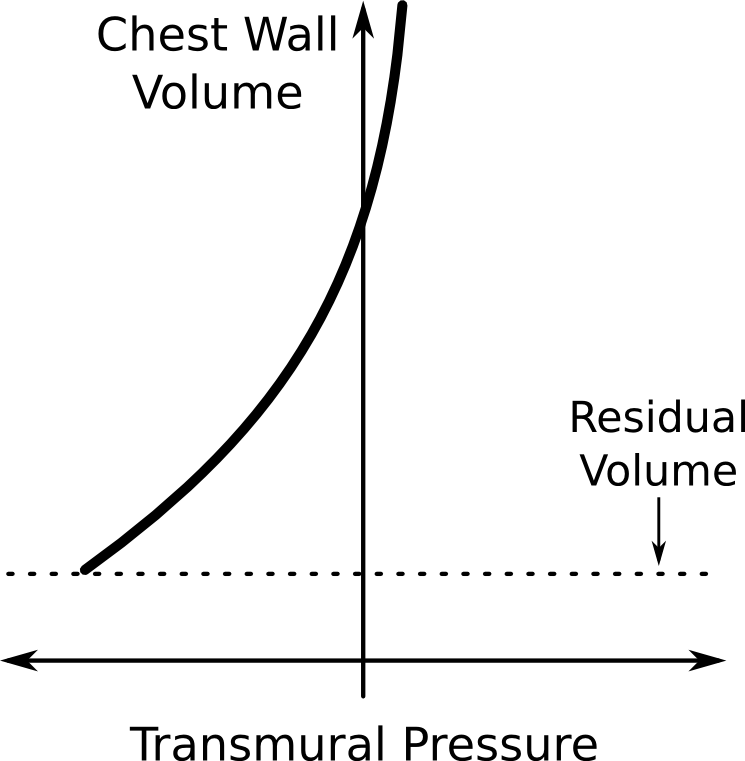 Chest wall compliance refers to the relationship between the volume of the chest cavity and the transmural pressure across it. As can be seen, negative transmural pressures are required to reduce the chest cavities size to the lung's residual volume. This demonstrates the chest wall�s natural tendency to spring outward and expand. However, at large volumes the chest cavity begins to resist further expansion as shown by the positive transmural pressures required to generate more expansion.